Digging through memories long buried, Cepeda journeyed not only into her ancestry but also into her own history. Born in Harlem to Dominican parents, she was sent to live with her maternal grandparents in the Paraíso (Paradise) district in Santo Domingo while still a baby. It proved to be an idyllic reprieve in her otherwise fraught childhood. Paraíso came to mean family, home, belonging. When Cepeda returned to the US, she discovered her family constellation had changed. Her mother had a new, abusive boyfriend, who relocated the family to San Francisco. When that relationship fell apart, Cepeda found herself back in New York City with her father and European stepmother: attending tennis lessons and Catholic schools; fighting vicious battles with her father, who discouraged her from expressing the Dominican part of her hyphenated identity; and immersed in the ’80s hip-hop culture of uptown Manhattan. It was in these streets, through the prism of hip-hop and the sometimes loving embrace of her community, that Cepeda constructed her own identity. 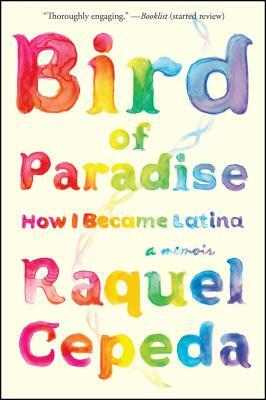 "In Bird of Paradise, Raquel Cepeda takes on, with cultural flair and brutal honesty, what it means to be the living embodiment of a global society. A Dominican-American woman seeking the truth about her roots, Cepeda uses tools including DNA testing and her reporterly skill for teasing out family secrets. What she finds is a revelation not just for her or for Latino Americans, but for anyone who cares about the way the past connects us to the future." "Raquel Cepeda has long been one of the hip-hop community's most passionate and visionary writers and filmmakers; now, with this stunning blend of memoir and reportage, mythos and logos, we will have to share her with the world. An elegant, electric mash-up, Bird of Paradise offers resonant snapshots of a bygone New York City, family portraits saturated with beauty, honesty, and pain, captivating travelogues, and a fascinating, wide-angled look at ethnicity and identity. Cepeda's story is wrought with care and insight – and ought to increase the sale of DNA testing kits by about twelve thousand percent." "I hope that Raquel Cepeda's experience searching for her roots will encourage more Latinos to look at themselves with the same honesty and fierceness." "...a fascinating mix of different avenues of spiritual influences." "At a time when Latinas of any age struggle with owning our voice and our identity and dealing with the mixed messages they get from this country—'We love you, we hate you! Stay! Go! '—Raquel Cepeda opens her heart and shows us all a new and real path towards the futuro, the future. I believe this book is transformational and will not only change lives, but save them too."